If new accounts are moderated at your class site or confirmation is required, you should have received an email from the system with directions for completing the process. With that email handy, return to the course website. 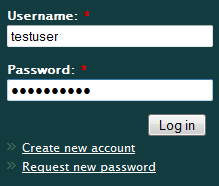 Enter your username and password in the "User login" box. Your initial password can be retyped or cut-and-pasted into the password box. If you cut-and-paste it, make sure you don't include any extra spaces before or after the password characters. The password and user name are case sensitive. Click on Log in. When you've successfully logged in, you will see your name in the upper-right corner of the page and then "My Account" and "log out" in the User Menu on the right side of the page (at the bottom on a smartphone). After logging in, you will also see additional links and options that aren't available to anonymous users. If you are unable to log in successfully, try re-entering your password. Remember that usernames and passwords are case sensitve, so make sure you don't have Caps Lock turned on by accident and that (if pasting in your password) that you don't include extra spaces. You may also click on "Request new password" if you ever forget yours.